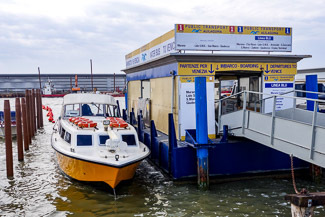 Aeroporto Marco Polo is the waterbus stop for Venice Marco Polo Airport (VCE), which is located north of Venice's city center on the Venetian Lagoon. You can buy Alilaguna tickets inside the arrivals terminal, from a ticket booth or machine by the pier, or (for a slight surcharge) on the boat. Private water taxis arrive and depart at boat slips next to the Alilaguna platforms. ACTV public water buses do not serve Marco Polo Airport.